This educational experience is structured to provide residents with diagnostic and treatment planning fundamentals as well as the associated clinical skills necessary for the practice of prosthodontics as a specialty and/or to prepare them for a career in discipline related teaching and research. 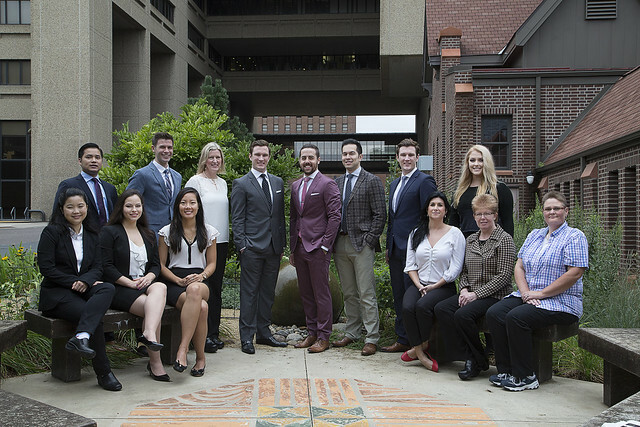 From 1969 to 2012, the University of Minnesota Advanced Education Program in Prosthodontics had the unique history of operating under the leadership of only two Program Directors. Dr. Richard J. Goodkind established the graduate program and received full accreditation status. He went on to lead one of the best prosthodontic programs in the nation, mentoring and graduating over 50 prosthodontists. The Members of the American College of Prosthodontists (ACP) Council for the American Board of Prosthodontics (ABP) are pleased to announce that Dr. Heather Joan Conrad has been elected as the new Examiner (Director) Elect of the ABP. She will be replacing Dr. Kent Knoernschild at the end of his term in 2018. Dr. Heather J. Conrad received her Doctor of Dental Medicine degree from the University of Saskatchewan and her Certificate in Prosthodontics and Master of Science degree from the University of Minnesota. She is currently an Associate Professor and the Director of the Advanced Education Program in Prosthodontics at the University of Minnesota. Dr. Conrad received the ACP Educator of the Year award in 2015 and became a Fellow of the American Dental Education Association (ADEA) Leadership Institute in 2016. She currently serves as Board Director for the ADEA Council of Advanced Education Programs. The Council appreciates your participation in this year's election. The right to vote for the new Examiner (Director) Elect is one of the key privileges enjoyed by Diplomates of the ABP. The Council will continue to work on behalf of the specialty to identify the best possible candidates to become an Examiner Elect for the ABP. To develop the diagnostic and treatment planning skills necessary for successful provision of complex prosthodontic treatment. To provide advanced didactic instruction in all phases of prosthodontics. To provide advanced clinical instruction in all phases of prosthodontics so that a graduating resident will have the clinical skills necessary to successfully practice prosthodontics as a specialty. To create an atmosphere that supports the development of a research protocol, completion of an associated project, interpretation of the results, preparation of a thesis and the ability to mount a successful defense, all leading to the awarding of an MS degree at the end of the program. To provide encouragement and the professional skills necessary for successful completion of the American Board of Prosthodontics Examination. To develop life-long learning skills. To foster an interest on the part of our residents in community health care, community service and dental education. To offer the best educational experience possible. To ensure successful completion and presentation of treatment plans/treatment for patients requiring complex restorative care as required in the prosthodontics treatment planning seminar course. To ensure successful completion all didactic courses associated with the program. To ensure successful completion of all clinical courses associated with the program. To ensure development of a research protocol, completion of an associated project, interpretation of the results, preparation of a thesis and the ability to mount a successful defense, all leading to the awarding of an MS degree at the end of the program. To ensure the development of a desire and the professional skills necessary for successful completion of American Board of Prosthodontics examination. To ensure that residents can successfully prepare and present topical seminars in prosthodontics and engage in a review of current and classic literature as required in the current and classical prosthodontics literature review seminar courses. To ensure the opportunity for development of an interest not only in teaching and related skills but also in the importance of service to the community. To solicit input on a regular basis from residents, program graduates and faculty to identify program strengths and any weaknesses requiring correction and to make any necessary corrective changes. The University of Minnesota Graduate Prosthodontic Clinic, located in the Moos Health Science Tower, is a teaching institution that provides a variety of high-quality, affordable prosthodontic and implant treatment options. Treatment provided in the graduate clinic is part of the three-year residency program in which licensed dentists are in advanced prosthodontic and implant training to become specialists in prosthodontics.